I never travel without a book or two or three, but that doesn’t stop me from buying new ones along the way, even if I haven’t finished what I brought. So, at a cute little bookstore along the wharf in San Francisco I picked up Jay Asher’s Thirteen Reasons Why. It isn’t new, but it’s one of those books that I’ve been meaning to read, and there it was front and centre. I had a little bit of a hard time getting into it at first, possibly because we were busy being tourists ( seeing the sights of San Francisco and then touring wine country, and on to the Redwoods) and partly because the subject matter is pretty tough. It’s about suicide. It’s the story of how a young high school girl who is full of life could reach a place where she’d want to end her life. And believe me, it’s an amazing journey. 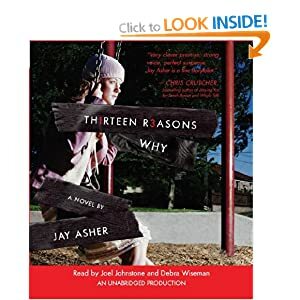 Once I had a chunk of time to sit down with Thirteen Reasons Why, I couldn’t put it down. The story is mainly told in two voices; that of Hannah’s taped voice (the words from her tapes appear in italics) and Clay Jenson’s voice; one of the thirteen people who received the tapes. Clay doesn’t know who delivered them, but he recognizes Hannah’s voice instantly. He listens to the thoughtless acts, secrets and betrayals of thirteen people and how each contributed to Hannah’s decision to take her life. At first Clay can’t understand why he’s on Hannah’s list. Other than that party where they talked and kissed, he’s never done anything to Hannah Baker except worship her from afar. But, over the course of a day and a night, he listens to Hannah’s voice and visits the places around town she indicates are important. The more he listens, the more he understands that small actions and even the lack of action can have enormous consequences. Thirteen Reasons Why is frustrating and sad, and funny, and hopeful all at the same time. Asher perfectly captures what it’s like to be a teenager; the way it feels to be excited and then disappointed. The way it feels to be used, or invisible. The way it feels to reach out only to be misunderstood, or understood too late. This is a difficult but compelling read that I highly recommend.